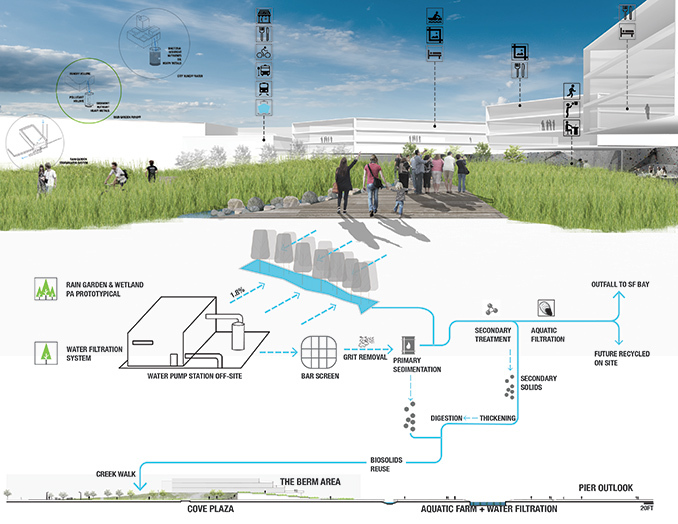 In the course of 102-acre master planning plan of a revitalized industrial wasteland as part of Central Waterfront in the Southern part of San Francisco, the design weaves the urban fabric and extends to the Bay, establishing an active advocate programs to enrich the community life and bring out the important sense sustainability to address future sustainable approaches. 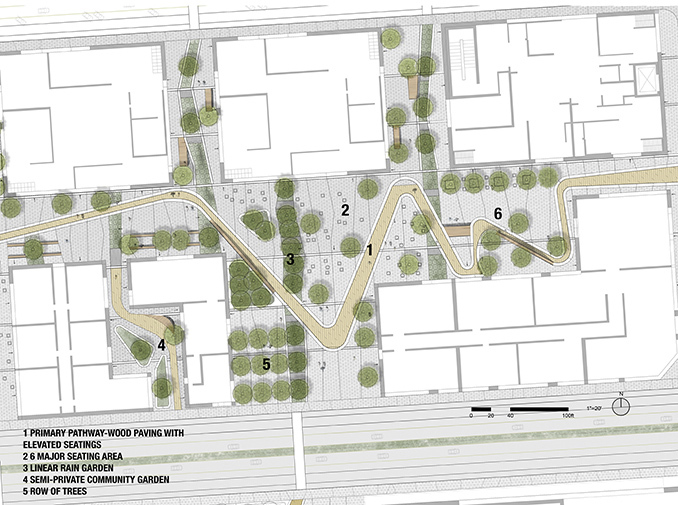 Instead of clearing away the remnants of the leftover building resources, the design accommodates facility needs of the neighborhoods and creates new entertaining anchor points adjacent to Illinois Street and 3rd Street. Giving back to residents and visitors multi-function spaces and opening up opportunities for educational purposes, light industry, aquatic activities/agriculture services, smoother and new transportation access and mixed-income residences, will integrate artificial barriers for a better living environment within San Francisco Bay Area. 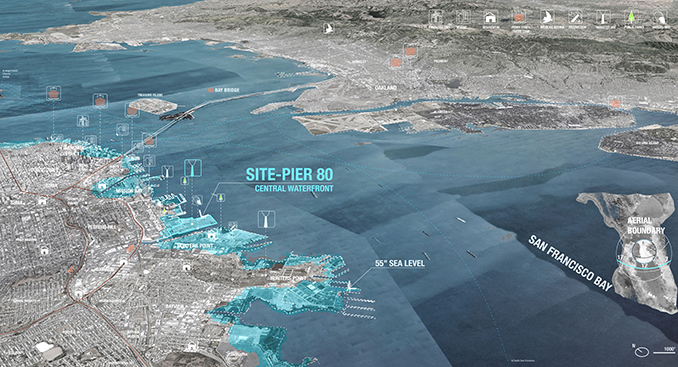 Pier 80 is located in South East tip of the city of San Francisco, anchored to the new Lannar Development area and one of the last largest parcels of land left in the city of San Francisco. It is situated at the tip of the city and surrounded on three sides by water, adjacent to Mission Bay, Dogpatch and Hunters Point. The neighborhood was primarily used for shipyard building activities, with active industrial production business communities. After 1906, Pier 80 was part of the landfill and depository, and now has remained cut off from the rest of the city. New development will have to co-exist with industries still in operation, such as 2 piers (Pier 70 and 80), a power plant, and a Muni Yard, which will bridge the gap to the surrounding neighborhoods. As industrial operations have shifted out of the area, this waterfront area has been rezoned to welcome new housing, retail, office buildings, and parks. 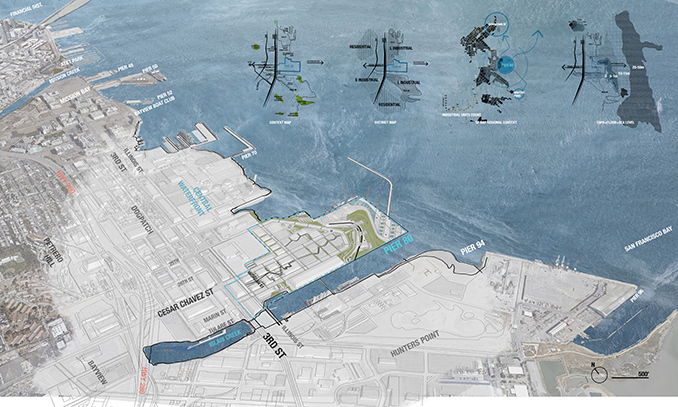 Becoming a transitional extension to the outer rim of the community, Pier 80 will be a lively cluster outcome of social, cultural and economical compound. 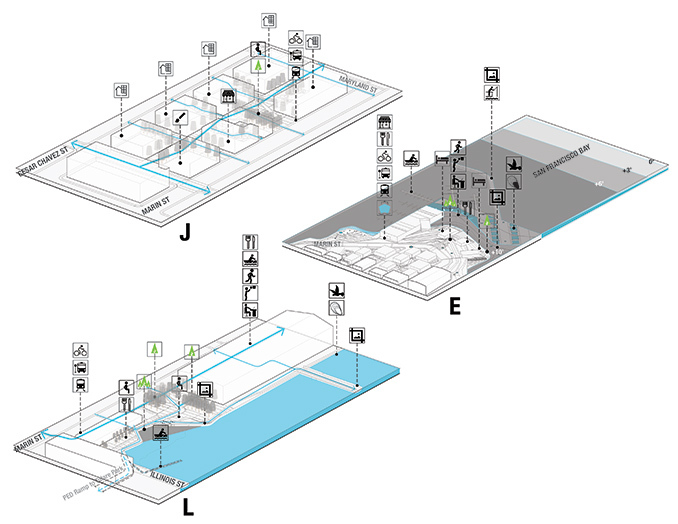 The design concept is a floating transformative flexible community all-in-one, where it can be self-sufficient on its energy, waste, services as the future comes. Respecting the existing characters of Central Waterfront, Industry, Art, Culture have become the essence of bringing the community together. In the first place, the design keeps the existing gigantic buildings on site and reuses them for new programming, a new ferry building on the upper Northern Edge which functions as Farmers’ Market to serve the whole community, and a new ferry stop as an extension to the existing SF Bay Ferry lines. On the lower south existing factory building, it is used for Oracle company for ship storage as the famous participant in the annual American Cup. Changing the old identity to embrace the new culture hub, it will become the Oracle Aquatic Center, keeping the same function, but upgrading to a community-friendly, mixed-use educational and entertaining space. The upper left edge buildings remain as industrial buildings for easy convenient access, adjacent to the 3rd Street. 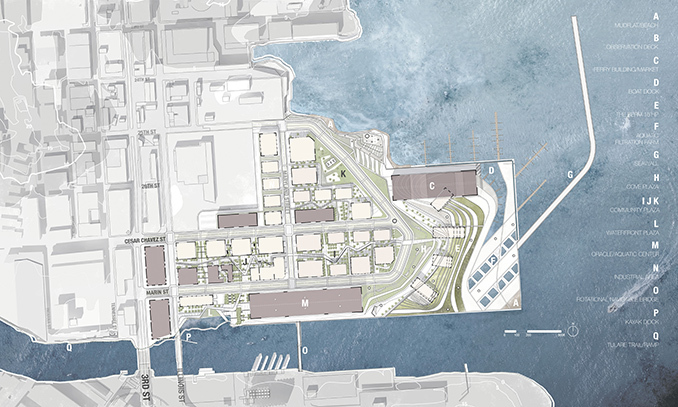 A proposing Ferry Building/market place will be in the upper right existing building, providing daily grocery needs for the surrounding residents and also reinforces the connections on water transportation. After the analysis of demographics, the design targets a certain type of residents – starting with the average mixed of low-income families in Hunters Point and high-income Dogpatch District. San Francisco is experiencing a rapid increasing housing rate and real estate values, it gives opportunities for having affordable housing in mixed-use buildings with offices for light industry, biotech businesses, start-ups, retail, studios for local artists and so forth. More grouped multi-family community housing creates safe, walkable pedestrian-friendly neighborhood. “Public life is essential to urbanism.” The dynamic uses of space will have a stable community, even during the night. Mudflat Beach (A) and Observation Deck (B) provide easy water edge full accessibility, and places that visitors can get in touch with water activities. The Cove Plaza (H), and lower bottom Waterfront Plaza (L) are the major people places providing, retail, and exhibition places. The Cove Plaza indicates a historical and sustainable installations along the walk. 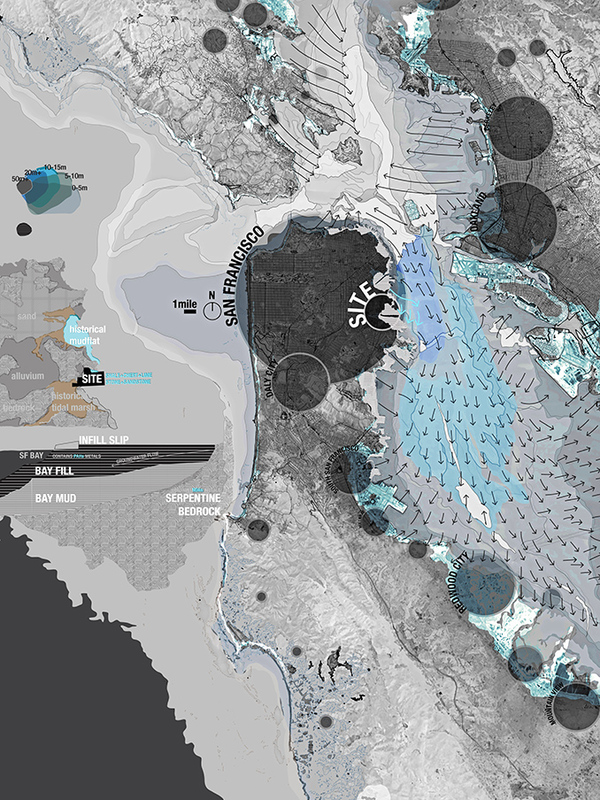 Strong wind and sea-level rise issues are the major concerns for the site in the next 100 years. By cutting out the existing pier deck and piling it up for the foundation of the Berm, it creates a brand-new elevated 16’ up point of view for the stunning San Francisco Bay. And the vacant space will be the new Boat Dock for the future use (D). The distribution of the Berm becomes a berm with a single-peak in the direction perpendicular to the axis, and gradually sloping down towards the edge, connecting the rest of the pier deck. In the meantime, having proposed buildings placing radially to shape a non-interfered view for both people walking from Cesar Chaves Street or Marin, and also increasing the interest for new rooftop deck, vertical planting structure, sports wall etc. 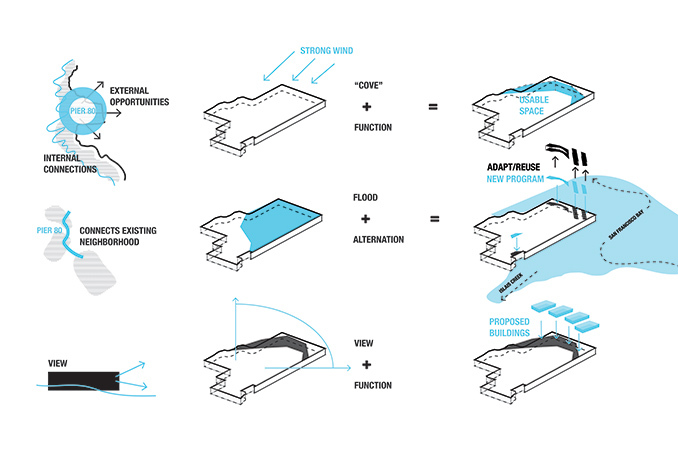 As the result of doing this, it not only provides an artificial shelter for the people from strong wind but also collects run-off from two other directions and conveniently cleans the stormwater and reuses for the adjacent aquatic filtration farm (F). 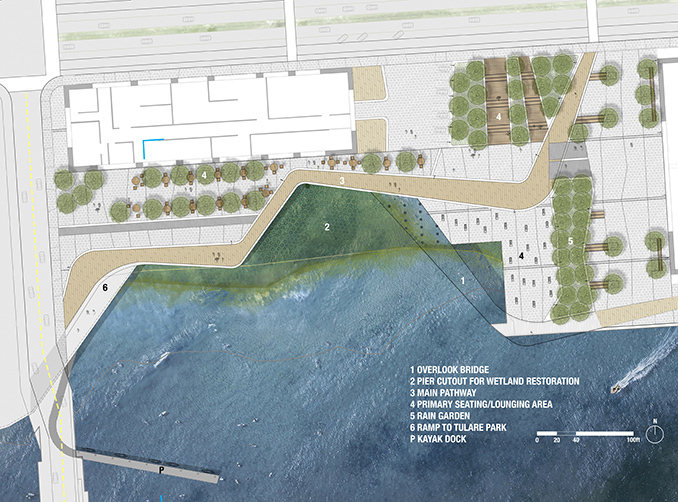 Another cut-out piece is the waterfront plaza (L); a large seating/lounging area combines with a nice view towards Islais Creek, and a wetland restoration area as well as future mussel bed restoration.